Powerslave, known as Exhumed in Europe and Seireki 1999: Pharaoh no Fukkatsu (西暦１９９９ ファラオの復活) in Japan, is a first person shooter game developed by Lobotomy Software and released for the Sega Saturn in 1996. The North American and Japanese versions of Powerslave contain a mini game called Death Tank that can be accessed if you collect all 23 dolls hidden in the game. The mini-game supports up to 6 players, which was increased up to 7 players in it's sequel, Death Tank Zwei, which can be found in Duke Nukem 3D. The original version appeared on the PC as a Build engine game and featured many mechanics, levels and content that varied differently. This includes linear level design, in-game speech from the main character, and stock lives that once they've run out, the game ends for the player. When the game was brought to the Sega Saturn and PlayStation, the game was rebuilt from the ground up using a proprietary engine called Slave Driver which was able to render more complex levels, including rooms above other rooms, which was not possible on the Build engine. It also went through a major gameplay re-design thanks to the stronger hardware. The PlayStation and Sega Saturn versions put more focus on exploration and allow the player to replay stages. In order to progress, certain permanent power ups (e.g. magic sandals that allow higher jumps) need to be collected. The Slave Driver engine would become a framework for PC to console ports by Lobotomy Software including Duke Nukem 3D and Quake. Powerslave was released on the Sega Saturn several months before its PlayStation counterpart, and for its time was a technical showpiece for the system. With better 3D performance, the PlayStation is able to add more visual effects, true transparency (negating the need for the checkerboard "mesh" pattern used for water), and performance improvements in some areas. While the Saturn version is capped at 30FPS, the PlayStation can reach highs of 60FPS. As was common for 3D games at the time, however, both versions struggle to hold their desired numbers - the Saturn dropping to 20FPS in more hectic scenes, and the PlayStation also dropping to 30 or 20FPS on occasion. The Saturn version, while slower in this regard, is therefore able to output a more consistent frame rate, with its PlayStation counterpart being noticeably more variable as more frames are dropped. The PlayStation version is also able to offer better lighting effects, however much of its level geometry has been paired back, with smaller, less complicated rooms being used throughout the experience (and some larger rooms being split up). While a new introduction area is added, several areas lose the sense of scale, to the point where some outdoor areas on the Saturn are indoors on the PlayStation. The auto-aiming feature of the Saturn version of Powerslave is less effective on the PlayStation, making it harder to hit smaller targets. Also missing is any form of analogue control - while Saturn Powerslave supports the 3D Control Pad, neither Dual Analog or DualShock controllers are supported on Sony's machine. Reportedly the red spiders were changed to blue scorpions to satisfy Sony's desire for PlayStation games to have unique content when ported from other platforms. On the PC, Powerslave is an entirely different game, and while many assets are shared between the three versions, the PC has unique levels designed for the Build engine (which on the PC is most notable for powering Duke Nukem 3D, as well as Shadow Warrior and Blood). 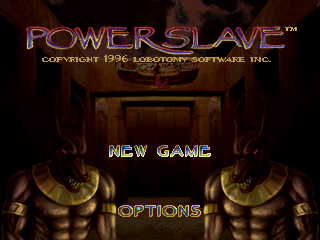 Powerslave uses an earlier version of the engine than Duke 3D, however, so there are no slopes in the game, and is much more linear in design than is console counterparts. Death Tank is exclusive to the Saturn version of Powerslave. Powerslave makes use of the Saturn's internal battery back-up as well as the Saturn Backup Memory to save data for progress. To load and save data from the Ram Cart, the save file must be created on the internal battery back-up first, then moved over via the Memory Manager.